I am pleased to inform you that Kanun Piano Duo album named UYANIŞ (Awakening) was released by KALAN Music Publishing last December in 2013. The album contains 16 pieces by Soviet Armenian composer Khachatur Avetisyan’s (1926-1996). 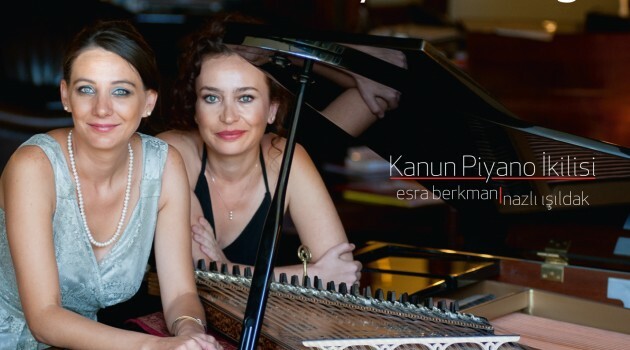 The Kanun Piano Duo, founded by Esra Berkman (kanun player) in 2008, aims at promoting the Armenian kanun repertory via performances while emphasizing the characteristics of the kanun as a solo instrument with the piano, and also at enriching the Turkish kanun repertory. The mission of The Kanun Piano Duo has always been to share the sounds of these two instruments together, which is a new experience for the Turkish audiences, and also to inspire the Turkish composers to produce new works for the kanun and the piano. These efforts of the duo found the best responses when Tolga Zafer Özdemir composed Fragments from Lykia Dede Ballet of four parts in 2010; which was followed by Enis Gümüş’s transcription for the kanun-piano of his work Başına Bağlamış Astar’dan; and in 2011 Uğraş Durmuş composed for the kanun and piano “At the Golden Horn, No: 2” and in 2013 Onur Türkmen’s composition “Reminiscences for the Kanun and the Piano”. These works have been performed by the Duo many times in their concerts in Turkey and abroad. As a composer brought up in the Soviet Armenian Republic and as part of the Soviet policies of culture and art, Khachatur Avetisyan produced quite a number of works for the kanun, which was then used in the traditional music forms and performance styles and thanks to these efforts, he gave a new form, in a sense “modernized” the instrument by means of European polyphonic forms and performance styles, via a repertory for ensembles with the kanun as duo, trio and quartet and also in the forms of sonata and concerto. The Kanun Piano Duo, has paid great attention to include in their repertory samples from all groups of Avetisyan’s compositions. Concerto for Kanon No. 2, Tsaghkazard, Bambasank, Perpetum Mobile, Zartonk, The Dance of the Spindles, Hin Tiflis are among the original works of Avetisyan’s, while The Dance of the Elderly, Kele Kele, Habrban, You are a Plane Tree, Kagavik, The Apricot Tree are in the form of Armenian transcriptions, and finally Anitra’s Dance, Romanian Dance and Ukranian Folk Melodies are among the European polyphonic transcriptions. The Kanun Piano Duo has been working with pianist Nazlı Işıldak since October 2011.